Forget the controversial ending, the boring mining mini-games or the lack of playable Hanar. If there's one element that I believe all Mass Effect fans can agree to love to hate (and hate to love), it's the series' elevators. The first Mass Effect introduced us to Commander Shepard, a galaxy on the brink of cataclysm and the unbelievable future fact that, in a time of faster-than-light space travel, we may well be stuck with slower-than-sludge elevator travel. There's an elevator in Commander Shepard's ship, the Normandy. To get from one level to the next, it takes 26 seconds, which is about the same time it takes the Normandy to fly from one corner of the galaxy to the other, at least when the game's running on my Xbox 360. Dusty Everman, senior level designer at BioWare and the man responsible for the Normandy and the elevators and other stuff in this trilogy swears this was not the plan. Well, the elevators were. But the elevators that moved like molasses were not. "Working elevators and airlocks are a much nicer and immersive experience than load screens. if they are quick," he told me this week over e-mail. "That was our level design philosophy for the Citadel and the Normandy in ME1, and, for the majority of the project, they worked great. They were quick. They were cool." He just said, in reference to Mass Effect's elevators that "they were cool." Can you imagine? Back to Dusty... "However, as development progressed, the elevators got slower and slower to cover content streaming, and, by the time we realized they would be so painfully slow, it was too late to replace them with a better system. In ME2 and ME3, the Normandy and Citadel had load screens. Lesson learned." Lesson learned, indeed. In the first game, you'd have to bring Commander Shepard to the Citadel a lot. When she'd get there, she'd travel with a party of two allies. They'd immediately need to take an elevator together. Loading time for that elevator ride? From the docking part of the Citadel to C-Sec? 51 seconds. Kaidan/Ashley: "I'm surprised you're willing to fight krogan, Wrex. I thought you'd stand with your own." Wrex: "Anyone who fights us is either stupid or on Saren's payroll. Killing the latter is business. Killing the former is a favor to the universe." Everman added: "I love Wrex." That kind of dialogue had been scripted, Everman told me, once the developers realized that elevators would take a bit of time to get where they were going in the first game. "To make the ride more entertaining, the elevator banter was added to make the load time of the elevator entertaining. This was a fantastic 'problem-tunity.' The writers were able to build character and flesh out the universe. It's just a shame that we trapped the player in a room and force fed it." Everman didn't think people were going to like the first Mass Effect's slow elevators. He recalled a horrible glitch that he discovered late in the development of that original game. And he recalled realizing that the only way to resolve it was to "heavily slow down the elevators." Turns out the backlash wasn't quite as bad as it could be. "The fact that I'm still walking the earth with unbroken legs means that gamers reacted much better to the elevators than I expected." Back in 2009, when I got a chance to interview the series' creative director, Casey Hudson, about the then-upcoming Mass Effect 2, I, of course, cut right to the important stuff and asked about the state of elevators in the sequel. "We have a completely new system to handle transitions between areas that speeds the load times and turns the loads themselves into part of the game experience," Hudson told me then. Perhaps he was referring to the Citadel's new fast-travel system. He was also doubtless assuring me that elevators wouldn't be a problem in ME2. Technically, the team swapped out elevators for simple loading screens. "When designed from the start, load screens are way easier to implement that functioning elevators, so in a way it was a step backwards," Everman said. "Sometimes tried and true methods are the way to go, cause, well, they are tried and true." 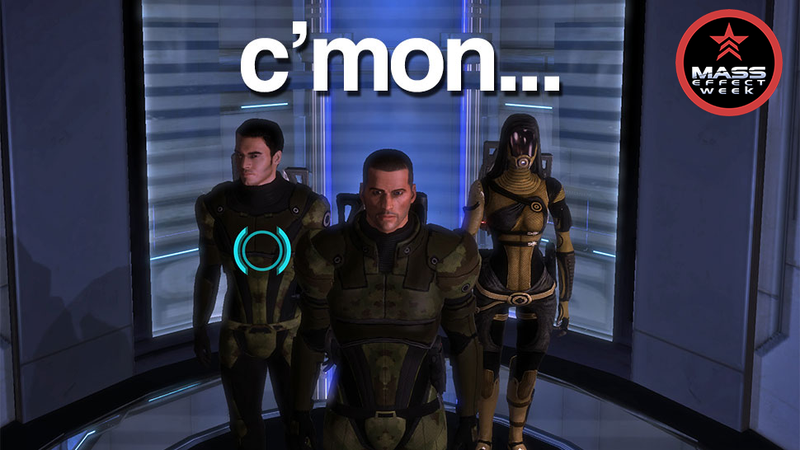 Load time in Mass Effect 2 in the Normandy from the CIC level to the Crew Deck: 35 seconds, but way less annoying since you're not watching Shepard stand in a slow-moving elevator. Load time in the Citadel from the docking level to the Presidium: 17 speedy seconds. The third Mass Effect game also had elevators, though, like the second, players didn't have to watch characters stand in them. You walked Commander Shepard into the elevator, picked a floor, and a load screen popped up. Load time to get from CIC to the Crew Deck in that game: 24 seconds (14 if the game was installed on the 360). Load time in the Citadel from the docking level to the Presidium: 30 seconds (20 if the game was installed on a 360). Ah, but Everman actually had wanted to have a working elevator in ME3. If you're shuddering at the thought, so is he. "For 95% of the development time, the Normandy had a quick functioning elevator," he told me. "However, it was déjà vu in the final hours, and the elevators needed to be slow to work hitch free. The days I spent replacing the ME3 Normandy elevator with load screens were a panicked flashback of ME1." Memo to the people making the next Mass Effect: Don't even think about elevators. Don't. The lack of slow-moving, chat-filled elevators in Mass Effect 3 wasn't mourned by many players. I never did see any petition to the Federal government to bring them back. Look, the only thing that takes longer to reach its conclusion than Kotaku's Mass Effect week is a Mass Effect elevator. Right? Who needs them? Good riddance! OK, he's not alone. We can all be nostalgic for this elevators. Even Everman. "The original Mass Effect was a massive undertaking, and we learned a great deal that we applied during the development of ME2 and ME3 to make a better experience," he said. "I'm proud of the game we made, but the elevators? Well, I love the squad banter. I love the immersion they provide. But I suspect that when I die, my elevator ride to hell will take a very, very long time, and Garrus is going to be asking about human history the whole way down."